The Easy Wave series of petunias features three new introductions for 2007: Beachcomber Mix (right), Tropicana Mix and Coral Reef. Easy Wave Beachcomber Mix is a beach-ready combination of Blue, Shell Pink and Coral Reef; Easy Wave Tropicana Mix features White, Shell Pink and Rosy Dawn; and Easy Wave Coral Reef offers deep coral blooms with small white throats. 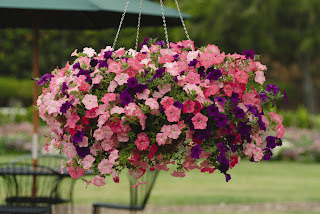 These bloomin’ beauties offer the same remarkable garden performance and amazing flower power of the entire line of Wave Family of Petunias. For more information, visit www.wave-rave.com.